One of the small animals is the Eagle sign. The Eagle sign is cut out in our workshop. 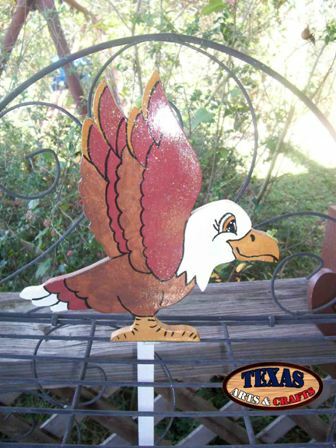 The Eagle is hand painted brown and white. The dimensions for the Eagle are approximately 9.50 inches tall by 9 inches wide by 1 inch deep. The sign has a 17 inch stake. The sign weighs approximately 1.50 pounds with packaging. For the continental U.S. shipping and handling is included in the listed price. For shipping outside the continental U.S. please contact us through our Contact Us page. One of the small animals is the Calf sign. The Calf sign is cut out in our workshop. 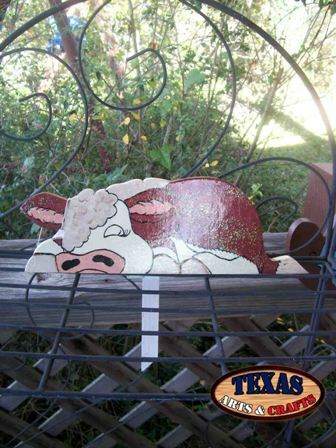 The Calf is hand painted brown and white. The dimensions for the Calf are approximately 9.50 inches tall by 13 inches wide by 1 inch deep. The sign has a 10 inch stake. The sign weighs approximately 1.50 pounds with packaging. For the continental U.S. shipping and handling is included in the listed price. For shipping outside the continental U.S. please contact us through our Contact Us page. One of the small animals is the Pig With Apples Sign. The Pig With Apples sign is cut out in our workshop. 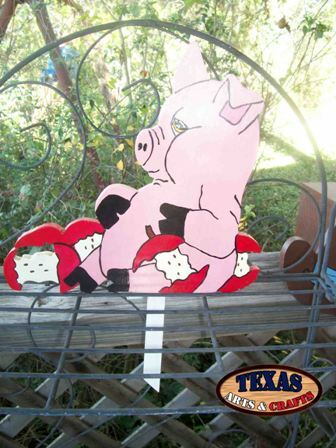 The Pig is hand painted pink with red apples. The dimensions for the Pig With Apples are approximately 11.25 inches tall by 12 inches wide by 1 inch deep. The sign has a 10 inch stake. The sign weighs approximately 1.75 pounds with packaging. For the continental U.S. shipping and handling is included in the listed price. For shipping outside the continental U.S. please contact us through our Contact Us page. A set of three small animals is the Chickadee, Blue Bird and Red Bird signs. These signs are cut out in our workshop. 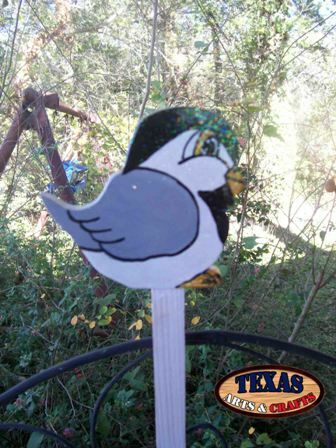 The Chickadee is hand painted gray, black and white. The Blue Bird is painted blue, and the Red Bird is painted red. The dimensions for the Chickadee are approximately 4 inches tall by 4.50 inches wide by 1 inch deep. The chickadee has a 17 inch stake. 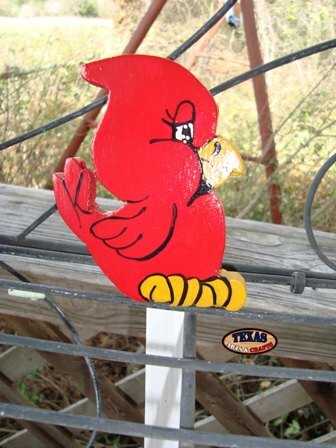 The dimensions for the Red Bird are 4.50 inches tall by 4 inches wide by 1 inch deep. The Red Bird has a 12 inch stake. The dimensions for the Blue Bird are 4.50 inches tall by 4 inches wide by 1 inch deep. The Blue Bird has a 12 inch stake. The signs have a combined weight of approximately 2 pounds with packaging. For the continental U.S. shipping and handling is included in the listed price. For shipping outside the continental U.S. please contact us through our Contact Us page. One of the small animals is the Pelican sign. The Pelican sign is cut out in our workshop. 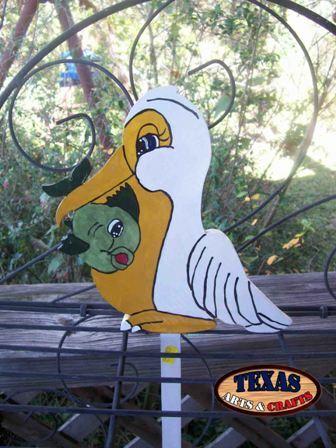 The Pelican is painted white and orange with a green fish in its beak. The dimensions for the Pelican are approximately 10.50 inches tall by 10.50 inches wide by 1 inch deep. The sign has a 24 inch stake. The signs weighs approximately 1.50 pounds with packaging. For the continental U.S. shipping and handling is included in the listed price. For shipping outside the continental U.S. please contact us through our Contact Us page. One of the small animals is the Mouse With Corn and Mushroom sign. 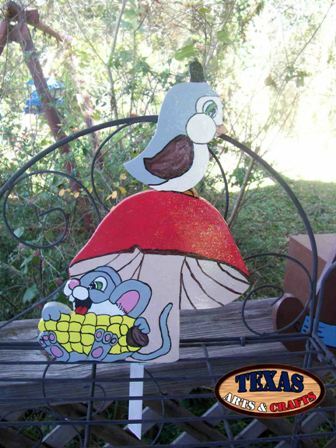 The Mouse With Corn and Mushroom sign is cut out in our workshop. The mouse is painted gray, the mushroom is painted red, and the corn is painted yellow. The dimensions for the Mouse With Corn and Mushroom are approximately 20 inches tall by 11 inches wide by 1 inch deep. The sign has a 14 inch stake. The signs weighs approximately 1.75 pounds with packaging. For the continental U.S. shipping and handling is included in the listed price. For shipping outside the continental U.S. please contact us through our Contact Us page. One of the small animals is the Alligator sign. The Alligator sign is cut out in our workshop. 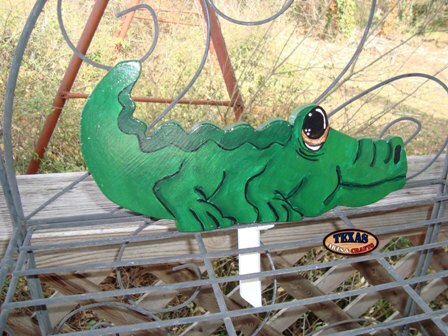 The alligator is hand painted green. The dimensions for the alligator are approximately 6.25 inches tall by 12.50 inches wide by 1 inch deep. The sign has a 5 inch peg. The signs weighs approximately 1.50 pounds with packaging. For the continental U.S. shipping and handling is included in the listed price. For shipping outside the continental U.S. please contact us through our Contact Us page. One of the small animals is the Ant Eater sign. The Ant Eater sign is cut out in our workshop. The Ant Eater is hand painted gray. The dimensions for the Ant Eater are approximately 6 inches tall by 14 inches wide by 1 inch deep. The sign has a 12 inch peg. The sign weighs approximately 1.50 pounds with packaging. For the continental U.S. shipping and handling is included in the listed price. For shipping outside the continental U.S. please contact us through our Contact Us page. One of the small animals is the Dolphin sign. The Dolphin sign is cut out in our workshop. 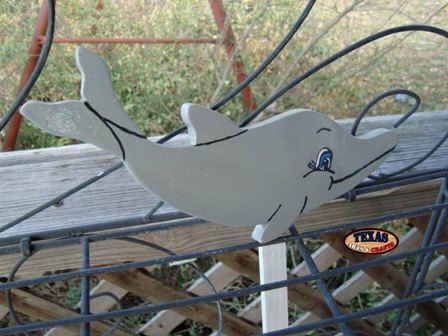 The dolphin is hand painted gray. The dimensions for the dolphin are approximately 6 inches tall by 10 inches wide by 1 inch deep. The sign has a 7 inch peg. The sign weighs approximately 1.25 pounds with packaging. For the continental U.S. shipping and handling is included in the listed price. For shipping outside the continental U.S. please contact us through our Contact Us page. One of the small animals is the Chicken Set. The Chicken Set is cut out in our workshop. 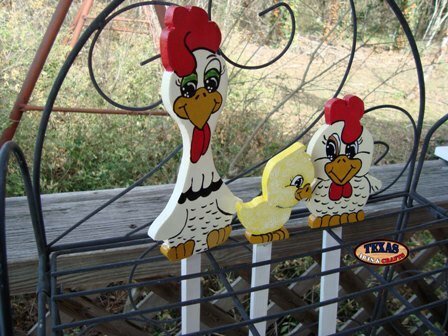 The rooster and the hen are hand painted white. The chick is painted yellow. The dimensions for the rooster are approximately 9.50 inches tall by 4.25 inches wide by 1.25 inches deep. The sign has a 18 inch peg. The dimensions for the hen are approximately 5.75 inches tall by 4.50 inches wide by 1.25 inches deep. The sign has a 11 inch peg. The dimensions for the chick are approximately 4.25 inches tall by 3.25 inches wide by 1.25 inches deep. The sign has a 12 inch peg. The signs weigh approximately 1.75 pounds with packaging. For the continental U.S. shipping and handling is included in the listed price. For shipping outside the continental U.S. please contact us through our Contact Us page. One of the small animals is the Rabbit With Carrot sign. The Rabbit With Carrot sign is cut out in our workshop. 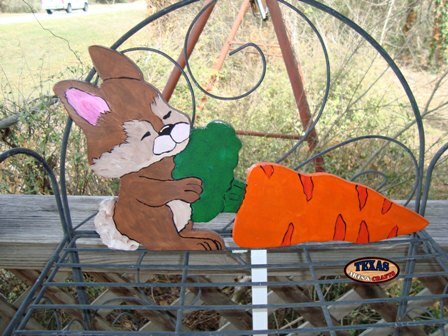 The rabbit is hand painted brown and the is painted carrot orange. The dimensions for the Rabbit With Carrot are approximately 10.25 inches tall by 19 inches wide by 1.25 inches deep. The sign has a 10.50 inch stake. The sign weighs approximately 1.75 pounds with packaging. For the continental U.S. shipping and handling is included in the listed price. For shipping outside the continental U.S. please contact us through our Contact Us page. One of the small animals is the Squirrel With Acorn sign. 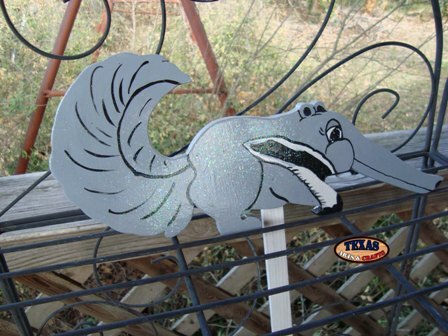 The Squirrel With Acorn sign is cut out in our workshop. 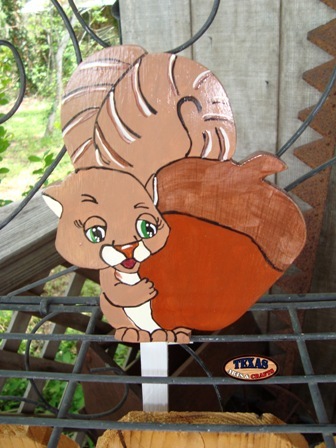 The squirrel is hand painted brown and the acorn is painted brown. The dimensions for the Squirrel With Acorn are approximately 7.50 inches tall by 6.25 inches wide by .50 inches deep. The sign has a 12.50 inch stake. The sign weighs approximately 1.25 pounds with packaging. For the continental U.S. shipping and handling is included in the listed price. For shipping outside the continental U.S. please contact us through our Contact Us page. One of the small animals is the Parrot sign. The Parrot sign is cut out in our workshop. The Parrot is hand painted red, blue, yellow. 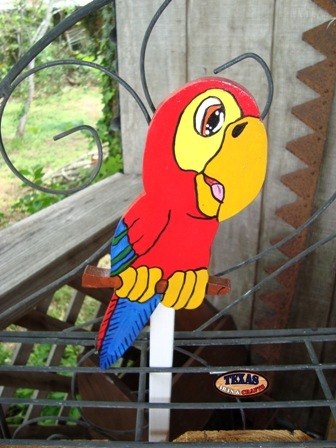 The dimensions for the Parrot are approximately 9.50 inches tall by 4.50 inches wide by .50 inches deep. The sign has a 20 inch stake. The sign weighs approximately 1.25 pounds with packaging. For the continental U.S. shipping and handling is included in the listed price. For shipping outside the continental U.S. please contact us through our Contact Us page.